Presenting a holistic and thoroughly practical investigation of the true nature of computer games that arms readers with a small yet powerful set of theories for developing unique approaches to understanding games. 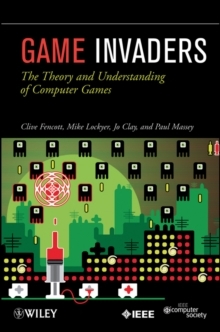 Game Invaders fully integrates genre theory, new media aesthetics, perceptual opportunities, and semiotics into a practical DIY toolkit for games analysis offering detailed guidance for how to conduct in-depth critiques of game content and gameplay. Featuring an informal and witty writing style, the book devotes a number of chapters to specific games from all eras, clearly demonstrating the practical application of the theories to modern, large-scale computer games. Readers will find: Suggestions on how to apply the DIY package to major issues central to understanding computer games and their design Coverage of the semiotics of video games, laying the foundation for such topics as the role of agency and virtual storytelling Tasks and solutions for readers wishing to practice techniques introduced in the book A companion website featuring access to an app that enables the reader to conduct their own activity profiling of games An important resource for those wishing to dig deeper into the games they design, Game Invaders gives game designers the skills they need to stand out from the crowd. It is also a valuable guide for anyone wishing to learn more about computer games, virtual reality, and new media.